You'd fill your pants in Canada. They "violate" such color standards all the time. The Girl brought some nice Columbian coffee home one day, and i was all bent out of shape because it was decaf. Luckily, i hadn't said anything, and the fact that it was in a green can meant nothing here. In the States, a green coffee can automatically means decaf--here, it means the company likes the color. The Canajuns have similarly irreverant attitudes toward other products. We all know yellow means cheap though. Tell me this doesn't make you think diet. this doesn't make me think diet. I think Set's identified the problem for you in this thread. A disproportionate number of your responses are from Canajuns. We don't have the same packaging colour conventions you do. We read the label to figure out what we're buying - that can doesn't say diet, so it doesn't make me think diet. As ceili and djjd's posts just above mine point out, we've even changed the convention on what colour packaging the no-name brands have. We're crazy like that. It doesn't make me think Diet coke (which does not have the same logo, it has one with a big "COKE"), it makes me think of Coca Cola's long-standing tradition of polar imagery around Christmas time and their affinity for seasonal can design. How would you feel if Coke Black were put in red cans? Yeah, it goes along with their Christmas time commercials. 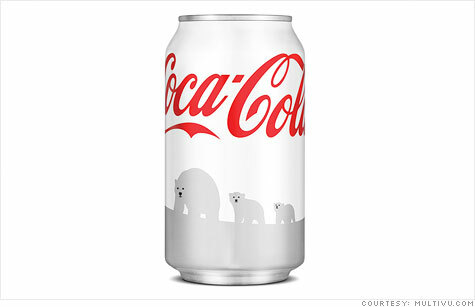 "Since the Coca-Cola Polar Bear was introduced in 1993, it has become a huge part of The Coca-Cola Company and a figure known the world over." I AM A MAN OF GOD. YOU ARE A TROLL. Why are you posting videos of diet coke. I DO NOT DRINK DIET COKE. Oh . . . i'd forgotten this silly thread . . . think i'll go drink another white can of coke . . .
You must have the IQ of a sand flea. Color does not dictate the product. By the way.....Diet Coke cans are silver. Diet coke has not been in a white can in over 20 years. Why you old charm school drop-out, you. Welcome to the site, and try to lighten just a smidge, OK? You wouldn't want to end up like me. Congrats Max, you win! Coke is pulling the cans because customers say white can coke tastes different or they thought it was diet.